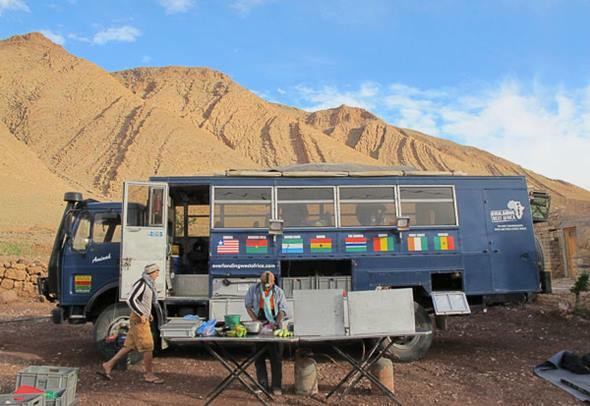 A 28 day epic overland adventure between Dakar, Senegal and Marrakech, Morocco. Join us on one of the great overland journeys in the world as we travel through the Sahara desert from West to North Africa! Spend time in enchanting St Louis – explore narrow streets dominated by pastel-coloured colonial buildings, watch the lively fishing market in action, browse fantastic art galleries, and feast on some of the best sea food in Africa! 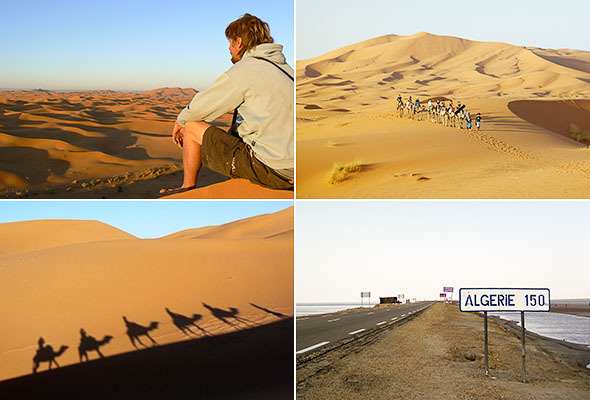 Overland towards the Algeria border and the town of Tamegroute, visiting ancient kasbahs on the old camel caravan route heading towards the Sahara desert! 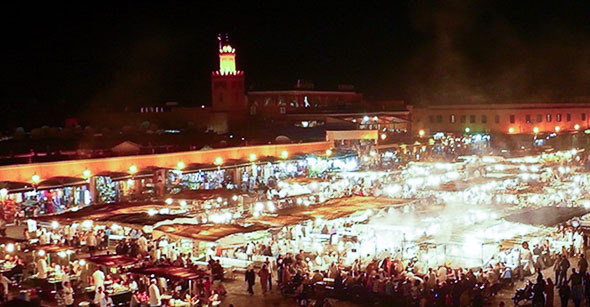 Finish the trip in Marrakech, one of Morocco’s 4 imperial cities – witness the world famous Djemaa El Fna square as it comes alive at night with food stalls, story tellers, and snake charmers! 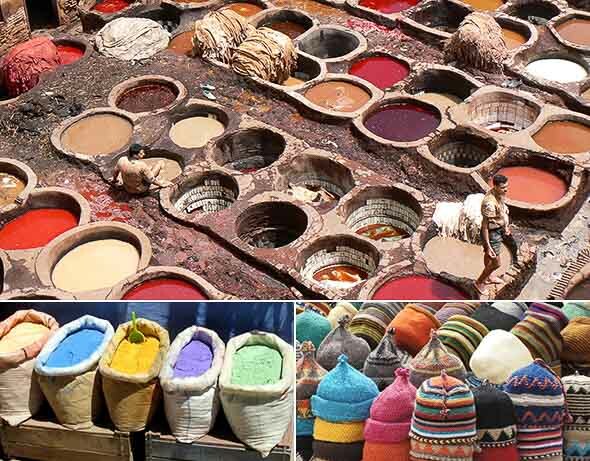 Explore the narrow streets of the impressive kasbah full of enticing souvenirs, visit the tanneries to see animal hides being washed and stained in a myriad of colours, and take a tour of the numerous palaces, museums, and mosques that dominate the city. Challenges: Is This Trip For Me? The first week of the trip will be pretty easy-going, with relatively short drive days on reasonable roads visiting a number of highlights. 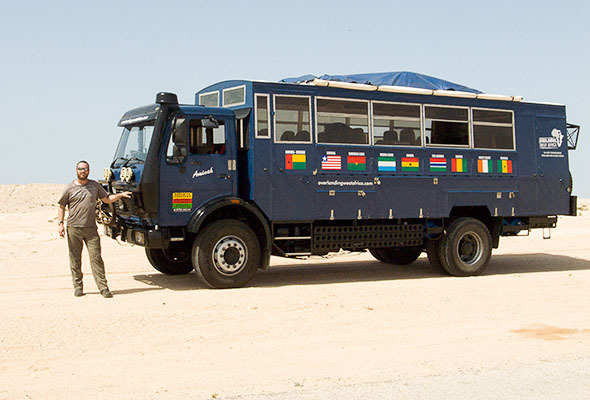 The time this trip spends in Mauritania will be limited due to current travel advisories. Though we would love to explore more of this little visited and truly fascinating country, security is of the utmost importance, so the trip will be limited to a direct south to north transit through the country over the course of 2 or 3 days. 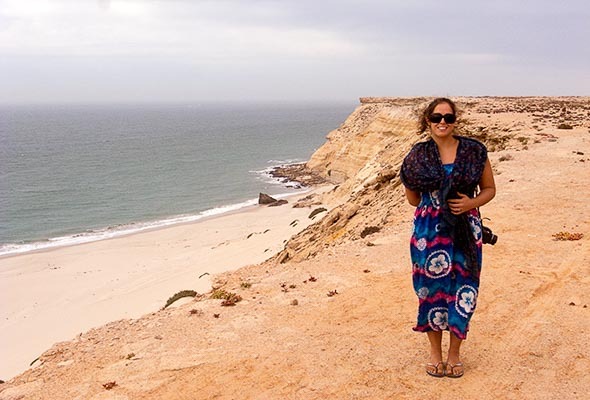 Once over the border into Western Sahara there will inevitably be some long drive days, but you will be rewarded with some spectacular landscapes and a true sense of remoteness as we drive along this stunning and remote stretch of the Atlantic coastline. The last week of the trip in the deep south of Morocco will be pretty easy going, with reasonable drive days on decent roads, and a chance to unwind and relax amongst some of the most fascinating sites Morocco has to offer. 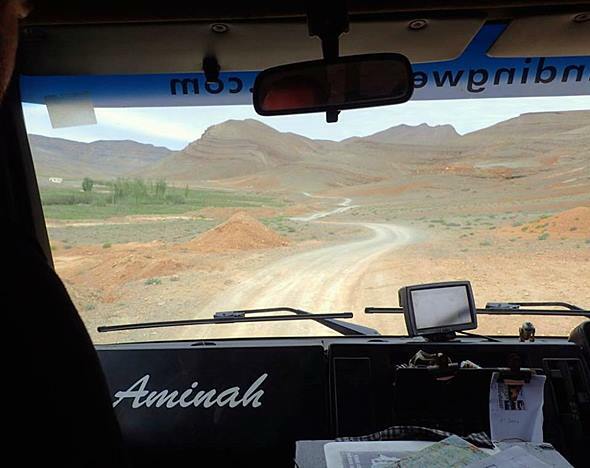 Be prepared for a true overland adventure along a route dominated by stunning landscapes and scenery! 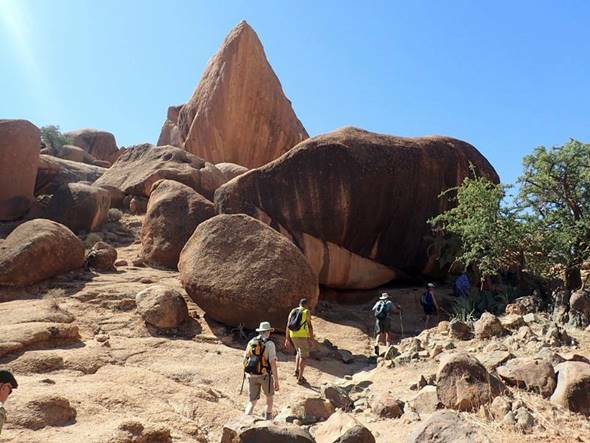 The first week of the trip is spent in the sahel in northern Senegal and southern Mauritania, a transitional area stretching from the savanna to the dunes of the Sahara. Starting in the Senegalese capital of Dakar, we’ll have two nights to explore this cosmopolitan and vibrant city, so plenty of opportunity to explore and visit some of the sights. Absorb yourself in art galleries and markets, experience the nightlife, visit the African Renaissance monument for sunset or take in some of the troubled history of the slave trade on the beautiful Île de Gorée. Leaving Dakar behind we’ll drive east for the city of Touba. 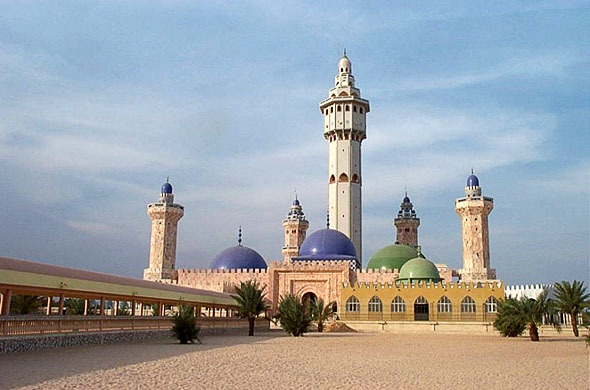 Arriving around lunch time we’ll have the chance to visit the imposing great mosque, said to be the most visited Islamic pilgrimage sites in all of West Africa. The mosque was built in 1926 to house the tomb of Saint Cheikh Ahmadou Bamba, a Senegalese man many consider as a messenger from God. Bamba founded the popular Mouride brotherhood in the late 1800’s, and was considered so popular that the French forced him into exile for a number of years in both Mauritania and Gabon. To this day Senegal’s famous Marabouts and Brotherhoods still hold significant influence in Senegalese society. The beautiful and ornate great mosque that dominates the Touba sky line is a fitting tribute for a man of such grand standing amongst the Islamic community. 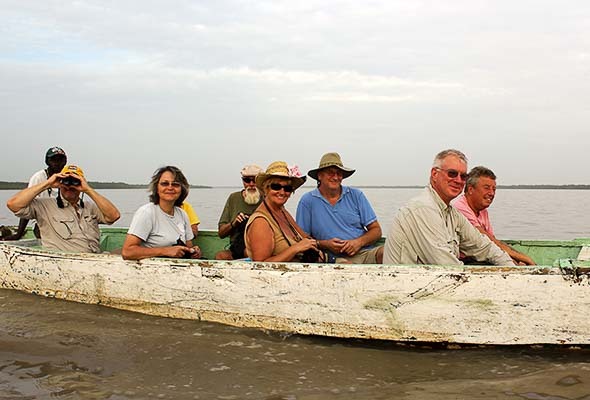 From Touba we’ll drive north to the Langue de Barbarie National Park where we’ll stay at a beautiful campsite on the banks of the River Senegal. The parks name translates as ‘Tongue of the Barbar’ as it lies on a narrow peninsula and was inhabited by the Barber tribe from Morocco for a period of time. You’ll have the chance to go on boat rides and guided walks to look for sea turtles, monkeys, and 160 different species of birds – or you can simply relax in the hammocks by the river and watch the fishermen going out in their colourful boats! 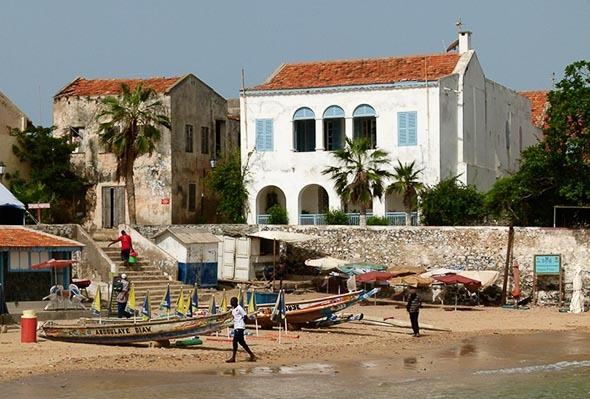 A short drive north brings us into the beautiful old colonial city of St Louis, the former capital of Senegal. 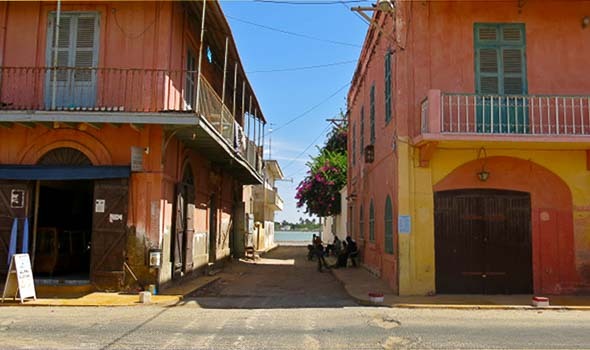 Originally founded as a trading post, St Louis is located at the mouth of the River Senegal and spread out along a narrow island, reached from the mainland by an impressive cast iron bridge. The old quarter is full of colourful architecture from the French colonial period, with most buildings now home to a number of great restaurants, bars, art galleries, and boutique clothing shops behind the wooden shutters. Walking around the narrow streets is, at times, reminiscent of being in New Orleans or Havana! During our time in St Louis we’ll stay at a campsite on a beautiful sandy beach within walking distance of the city, from where you can visit the impressive fishing harbour. It’s well worth getting up at sunrise to see the fishermen launch their colourful boats into the river as they head off to cast their nets, and definitely worth visiting in the late afternoon as they return with their catch and the bartering for the fish begins! 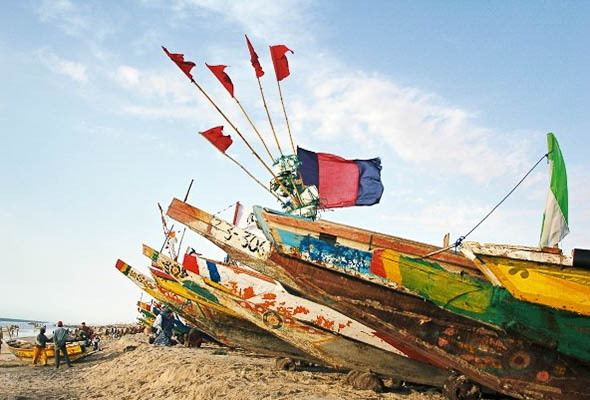 You’ll see the fishermen working on their boats along the shoreline – it’s quite a sight as dozens of men chisel huge chunks of timber into shape and lovingly decorate them with bright colour schemes! From St Louis a long day awaits us as we head north for the Mauritanian capital, Nouakchott. 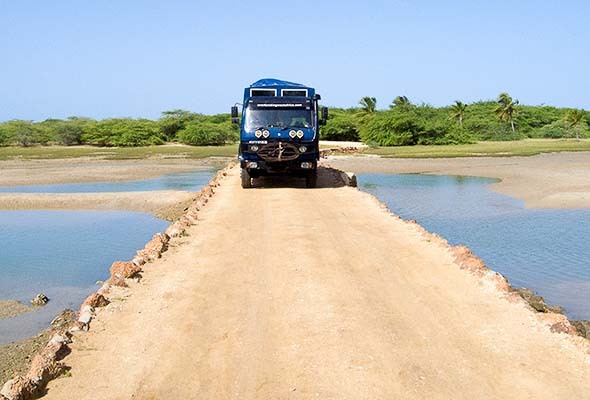 Depending on the weather and road conditions we will cross the border into Mauritania at either Diama or Rosso and say goodbye to the River Senegal for the last time. We’ll spend the night at an auberge in Nouakchott where, weather permitting, you can sleep on the roof terrace under the stars in a traditional Bedouin tent! As stated in the ‘challenges’ section near the start of this page, our time in Mauritania is limited to a direct south to north transit. Though we would love to head east and explore the Mauritanian Sahara, current travel advisories dictate where we can and can not go. Depending upon travel advice at the time, there might be the chance to spend some time in Nouakchott to visit sites of interest. 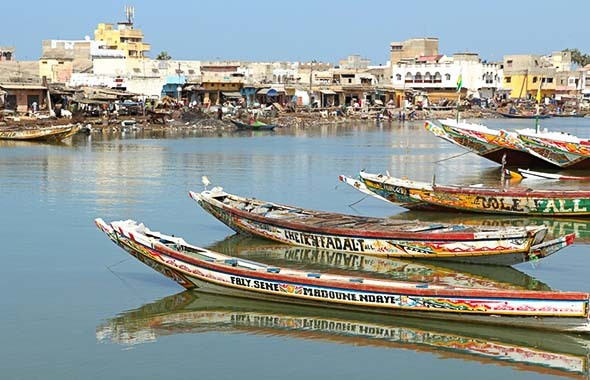 The fish market, or port de peche, is considered one of the liveliest in all of West Africa, and guaranteed to impress with dozens of colourful fishing boats lined up along the beach. It’s also worth visiting the bustling central market and grand mosque to go people watching. 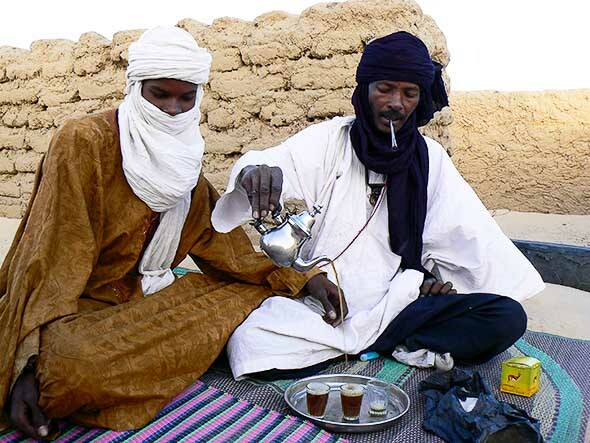 Mauritanian men wear a distinctive traditional robe called the Dara which is usually light blue or white with decorative golden trim. 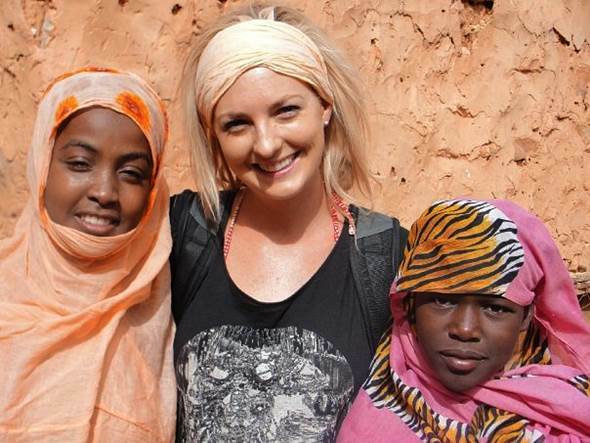 Women often wear a wrap around called the Malaffa. Mauritanians are largely descended from the Maures and therefore quite different from people in neighbouring countries. Leaving Noukachott behind, the big journey north into the Sahara Desert begins! You’ll really start to notice the landscape change as we say goodbye to the scrubland of the Sahel and hello to the sand of the Sahara desert. 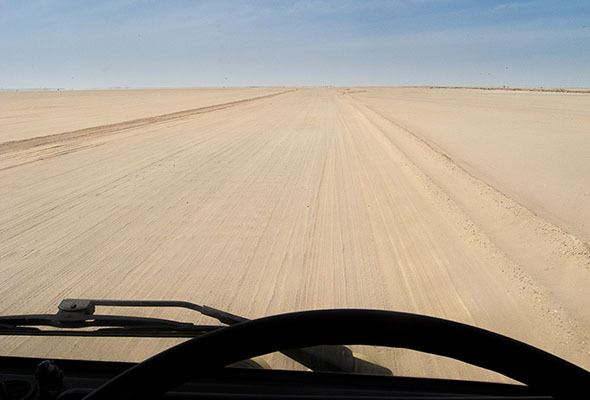 An estimated 90% of the Mauritania is covered by the Sahara Desert, so you’ll see a lot of sand as we journey between the south and the north of the country! 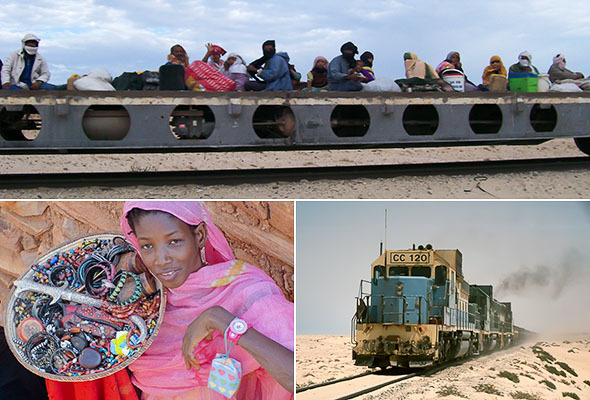 With luck we will see the world famous iron ore train as we get close to the Mauritania-Western Sahara border. This train is said to be the longest in the world, sometimes up to 2.5kms long, and carries huge amounts of iron ore from the mines near Zouerat in the east of Mauritania to the coast at Nouadibou. Locals often travel on top of the iron ore out in the open, wrapped up from head to toe to protect themselves from the dust. As we drive between the Mauritanian and Western Sahara border posts we’ll pass through an area of ‘no-mans land’ famous amongst travellers for being strewn with land mines. 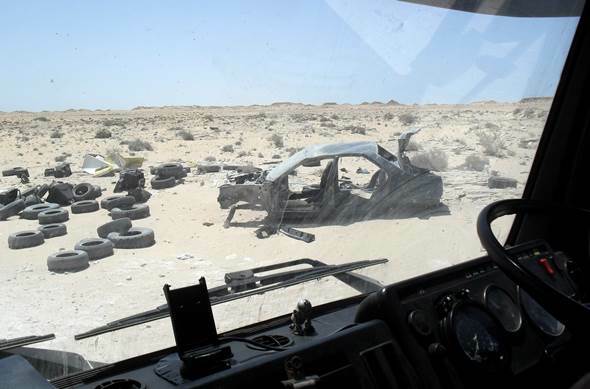 Dozens of vehicles that didn’t make it from many years ago still litter the side of the tracks, as well as abandoned vehicles from people who didn’t have the correct paperwork to enter Mauritania. No need to worry though, it’s nowhere near as scary as it sounds! The track is clearly defined and navigated by hundreds of vehicles a day. It’s certainly one of the most intriguing border crossings in the world, as at times it feels like you’re driving through a scrapyard located in the desert! It will be quite a long day from Nouakchott to the border, so once we’re stamped into Western Sahara we’ll most likely set up camp for the night. Western Sahara, or Sahara Occidental, is classed by the United Nations as a disputed territory. Many different tribes have called this region their home over the centuries, including the Sahrawi people, who have fought with both Morocco and Mauritania for an independent country since the Spanish left in 1975. Huge swathes of the territory are ruled by Morocco, with a more autonomous region administered by the Polisario further inland closer to the Algerian border. 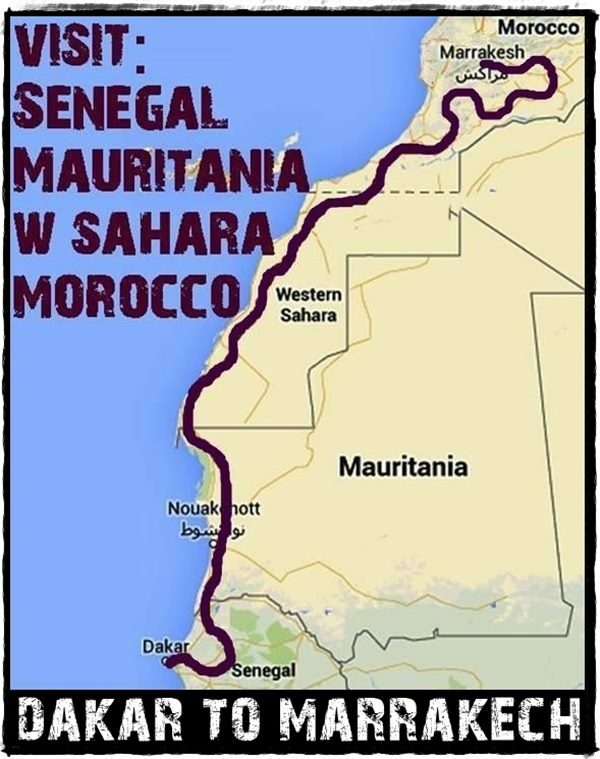 Our journey through this sparsely populated territory will follow the coastal highway that runs for thousands of kilometres north connecting Mauritania to Morocco. Over the course of the week you will be treated to some of the most spectacular desert scenery you can imagine, including sand dune ranges, dramatic cliff drops falling into the ocean, pristine golden beaches stretching for hundreds of miles, nomadic herders searching for pasture for their camels and goats, as well as small fishing communities launching their boats and nets into the Atlantic! We can’t guarantee where we will stop for each night, but we’ll aim to spend time in and around Dakhla, Laayoune, and Tarfaya before crossing the imaginary line that marks the ‘border’ between Western Sahara and Morocco. 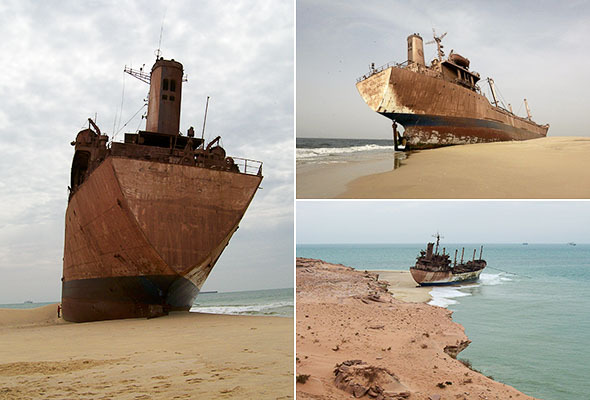 Our first port of call in Western Sahara will be Dakhla, located on a narrow spit of land stretching out into the Atlantic Ocean. Located just 20kms or so north of the tropic of cancer, the scenery in and around the city is beautiful, with pristine beaches and dramatic cliff faces dominating the view. Dakhla has become a well-known kite surfing destination (yep, that’s right, it can get very windy along the coast here! ), and it’s well worth going up the old Spanish lighthouse for great views of the surrounding landscape. Dakhla is a heavily militarised area but ultimately quite a sleepy town. You really do get a sense of being in the middle of nowhere when all roads in and out lead into the Sahara desert! Heading further north with incredible views along the way, our next stop will be Laayoune, the largest city in Western Sahara, where we’ll have the chance for a quick look around and to stock up on food, water and diesel. From Laayoune a short drive north brings us to a beautiful traditional bedouin campement where we’ll spend a couple of nights. 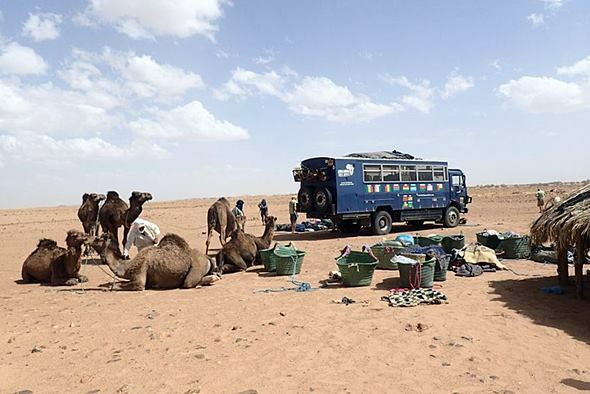 The campement is ideally located for access to some of the best accessible highlights in Western Sahara. There are a number of optional visits you could go on from the campement, including a 4×4 jeep trip around the Sebkha of Oum Dba. This stunning area is a rugged depression, with a beautiful display of colours on show as you’d expect from a salt flat located in the desert! 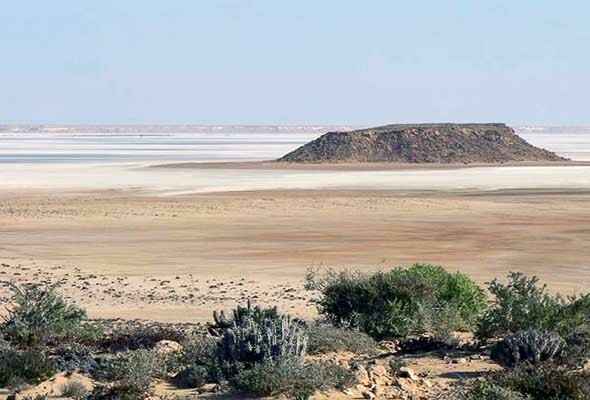 There is a salt mine at the far end of the lake which makes for an interesting visit, as well as Mount Gara which is located in the middle of the depression and well worth climbing to experience commanding views of the surrounding landscape. 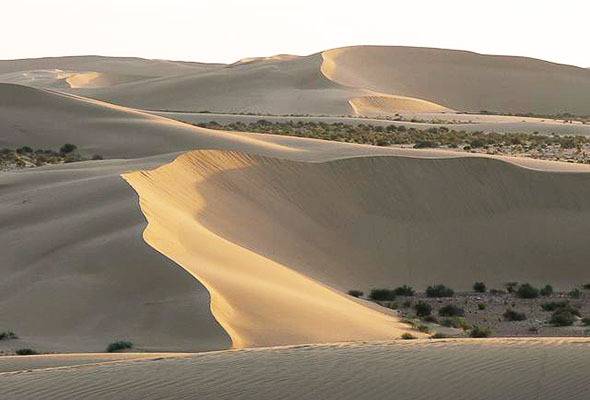 Extensive sand dunes are within easy walking distance from the campement, as is a seasonal waterfall. You could also take a 4×4 jeep trip to the Sebkha of Tah. 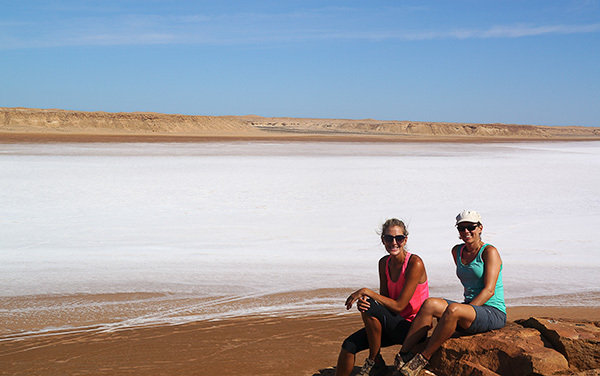 Spread over a huge expanse at nearly 100 meters below sea level, you can walk around the depression on the surrounding cliffs to get a wonderful contrasting view of the salt flats against the sand dunes against rocky outcrops. A truly beautiful natural phenomenon! Our next stop will be Tarfaya, the first significant town we will reach after crossing the imaginary dividing line separating Western Sahara from Morocco. Tarfaya is the closest town on mainland Africa to the Canary Islands, just a short distance from the coast here, yet considering its geographical significance is a sleepy and laid back place. 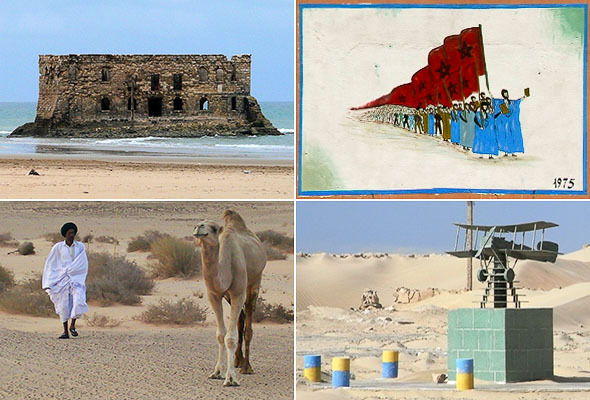 Tarfaya has an interesting history. In 1975 hundreds of thousands of Moroccans gathered here as a staging point to launch the ‘Green March’ orchestrated by King Hassan. This was the event that saw Morocco stake its claim to Western Sahara after the Spanish agreed to leave the territory. Over a period of 4 days the Moroccans marched south into Western Sahara, before turning back again towards Tarfaya. Our next stop will be the Naila Lagoon, a beautiful lake surrounded by rolling sand dunes in the Khenifiss National Park. The lagoon is home to a large number of migratory birds such as flamingos, grey herons, and whimbrels, as well as a huge variety of fish. We’ll camp for the night a little further along the coast from TanTan, from where the scenery will soon start to change as we carry on north for the next leg of the journey! We’ll start the next leg of our journey by heading to the coastal town of Sidi Ifni, a former Spanish town dominated by white-washed and art-deco style buildings, including the old Spanish consulate. Just off the coast is an abandoned Spanish fort located on an island which can be reached by foot at low tide, and also a tower which used to support a cable car that carried people to and from the island. The following day we’ll drive the short distance to Legzira beach to see the impressive sea arches. This beautiful stretch of coastline has been battered by the Atlantic wind and waves for centuries, resulting in 2 stunning sea arches – one of which unfortunately collapsed in 2017. Walking on the cliffs above gives you the chance to take some great photos, and once the tide goes out you should be able to get some great shots posing under the arches! From here we’ll continue north and drive the short distance to Tiznit for the evening. The scenery now begins to change as we start climbing on windy roads into the Anti-Atlas mountains, heading for a small town called Tafraoute. 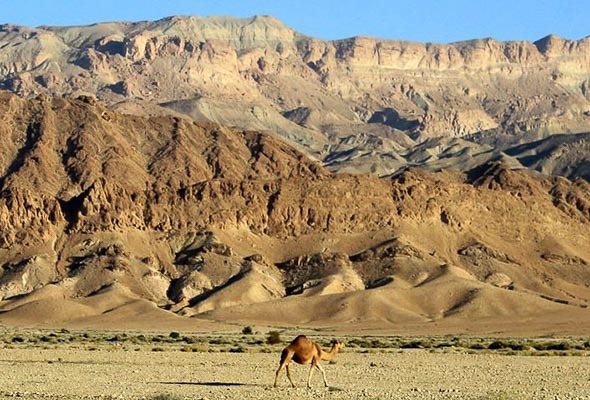 Stunningly located in the heart of the Ammeln Valley, Tafraoute is a small Berber town loved by travellers for having some of the most spectacular views and sunsets anywhere in Morocco. The town sits approximately 1,200 meters above sea level and is surrounded by pink granite rock. When the light reflects off the surrounding cliff faces at sunset it really does make for a spectacular sight! The town is also famous for its painted boulders. In 1984, a Belgian artist called Jean Veran took a team of workers with a huge amount of paint and sprayed a number of boulders in a myriad of bright colours. Some call it a magnificent sight, others say it’s graffiti – we’ll leave it to you to make up your own mind! The scenery in and around Tafraoute is made even more stunning by an abundance of palm, olive, and date trees which dominate the surrounding valley, as well as brightly coloured traditional Berber architecture nestled in amongst the cliff faces. 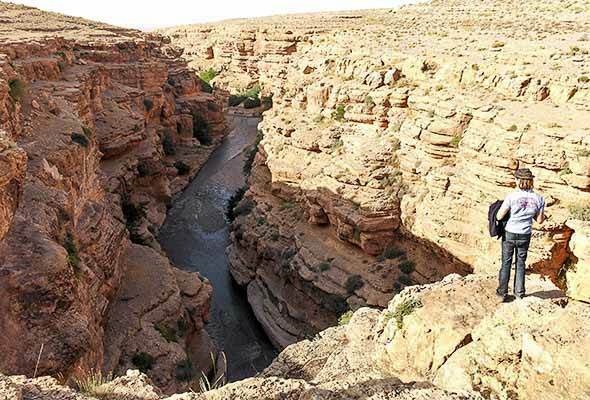 We’ll spend a couple of nights in Tafraoute for the chance to go hiking, rock climbing, and to experience the traditional way of life of the Berber people. 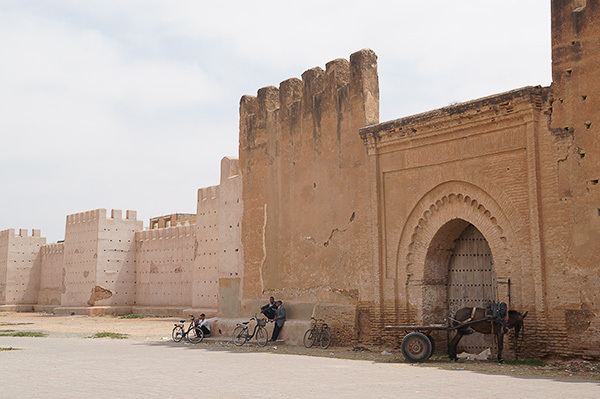 Our next stop is the town of Taroudant, located in the Sous Valley and also known as ‘Little Marrakech’. The town is surrounded by an extensive series of walls and ramparts, and has quite a sleepy and laid back atmosphere for a town of its size. 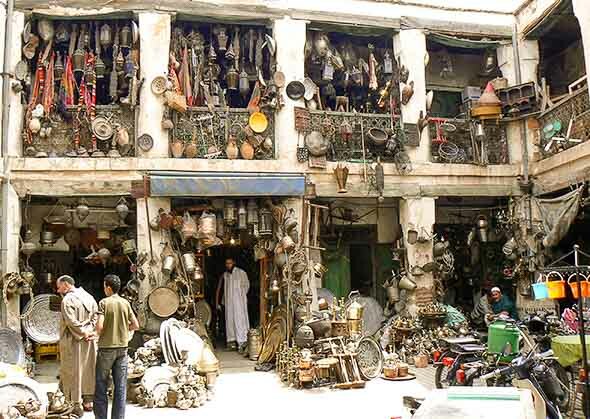 Berber tribes come to Taroudant from the surrounding villages to sell their crafts and wares in the souqs here, offering better value for money than in the larger cities to the north. From Taroudant we’ll drive north east for an afternoon visit to the ancient ksar of Ait Benhaddou. 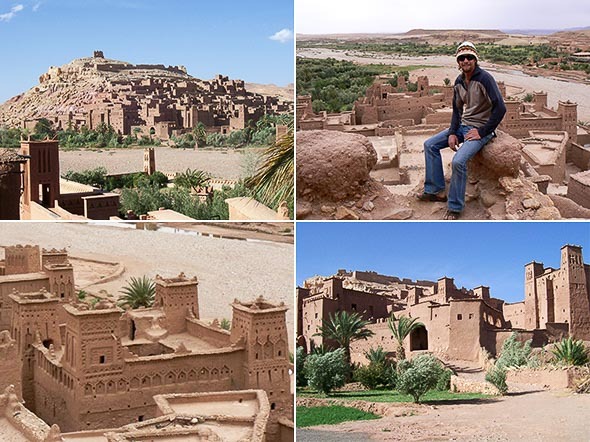 A ksar is a fortified city, with decorative ramparts and houses made out of mud bricks. 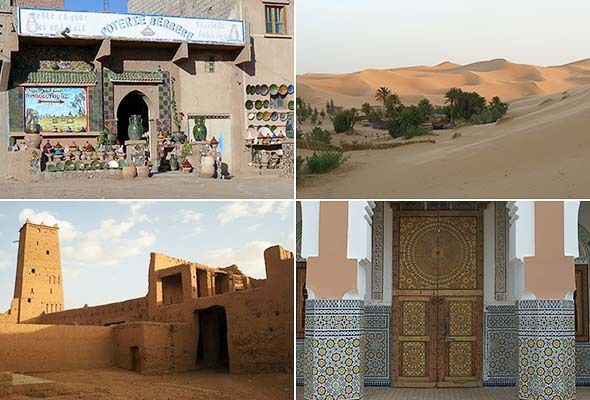 The route we drive along is dominated by a number of ksars, as this was the primary highway for merchants and traders travelling from Marrakech to the Sahara desert and back again. Ait Benhadddou is the most famous ksar, having featured in many films over the years including Gladiator, Kingdom of Heaven and Prince of Persia. It’s a truly impressive setting, with some families still living within the walls of the UNESCO listed buildings. You’ll get some great panoramic views from the top of the surrounding mountains and the Ounila river running along the entrance to the city below. Our next stop is the small town of Tamegroute not far from Zagora. On the way we’ll stop to visit a number of other ksars along the highway. You’ll really start to see the landscape change as we leave the Anti Atlas mountains behind and descend into the arid plains on the fringes of the Sahara desert. We’ll spend the night in Tamegroute, visiting the koranic library to see the ancient sufi manuscripts, and also the pottery workshops made famous by their green-glazed ceramics. The next 3 nights will be spent in and around the Sahara desert. From Tamegroute we’ll head south towards the Algerian border and the small town of M’Hamid, from where we’ll load up and head out into the desert. 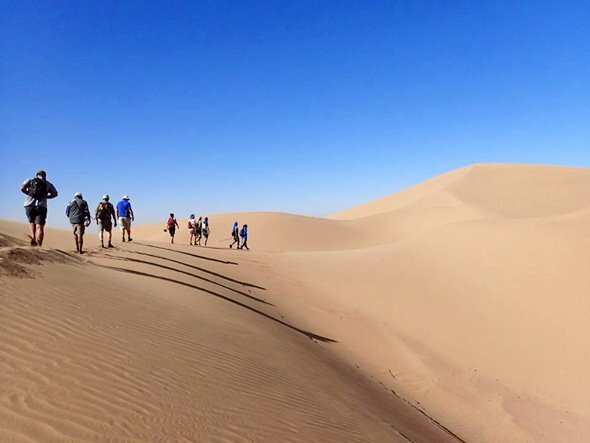 This is a real highlight of the trip as we go trekking amongst the vast sand dunes of Erg Ezahar and the oases of the Sahara desert, sleeping under the stars on the way, as well as learning about the traditional way of life of the desert nomads. There’s also the chance to learn how to cook the Berber way, as well as the option to go sand boarding on the dunes of Erg Ezahar! This part of Morocco is one of the most photogenic and fascinating regions, with vast sand dunes, desert oases, palm trees, camels, history, culture and friendly people dressed in their traditional clothes – an experience we’re sure you’ll always remember! 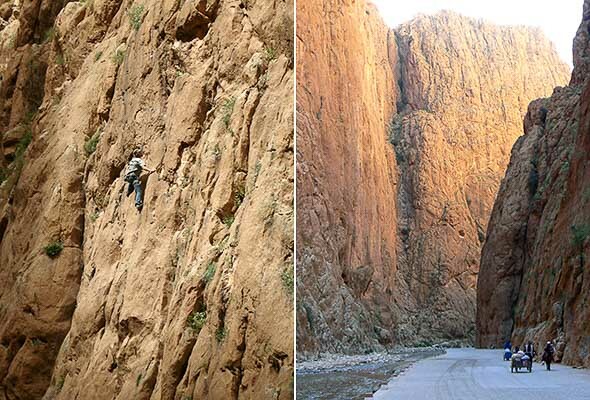 From the Sahara we head north east to Todra Gorge, a deep canyon carved through the Atlas Mountains by the river Todra. This is picture postcard Morocco at its best, with palm and date trees nestled in small Berber villages at the side of the road, making for a beautiful drive as we climb further into the Atlas mountains to reach Todra from the town of Tinerhir. The most spectacular part of the gorge is a 600 meter long section that narrows to as little as 10 meters wide in places. The steep red-tinged cliff faces either side of the gorge are truly spectacular, especially when the sun sets, creating a wonderful warm glow and reflection in the sky. You’ll have best part of a day for hiking in and around the gorge and the surrounding mountains. If you’re feeling adventurous there is the possibility to go rock climbing or horse riding. If you want a more relaxed time you can simply walk around the gorge taking in the scenery. Around the late afternoon we’ll head out of the gorge and get going for a bush camp close to the Akhiam caves. The drive to get here is truly spectacular as we wind our way through the mountains on dirt roads! The next morning we’ll have the option to go trekking to the Akhiam caves. The terrain is nothing short of spectacular, with a seasonal waterfall dropping over the entrance to the vast cave. 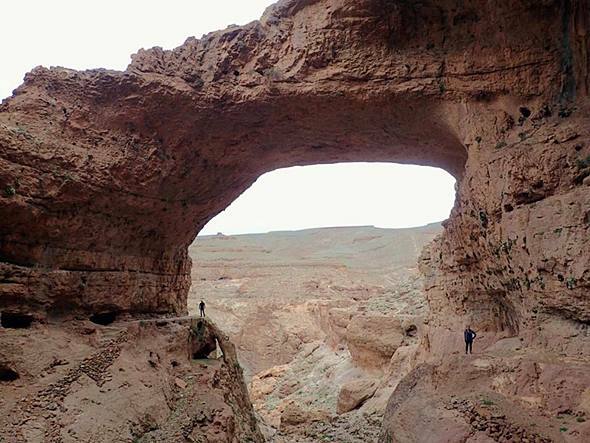 To get there you need to cross under an enormous natural arch which makes for some superb photos! From the caves we’ll head east for our final journey of the trip towards Marrakech, stopping for a bush camp en route. Marrakech is the most southern of the 4 imperial cities of Morocco, where we will stay at a small hotel within walking distance of the major highlights. One of the most spectacular sites in Marrakech is the main square in the old town called Djemaa El Fna. By late afternoon the square starts filling up with story tellers, snake charmers, and food stalls. By the evening the square is literally heaving with activity, which makes for a truly incredible sight when viewed from above on the surrounding roof top terraces. Located just off Djemaa El Fna, the medina is easily one of the most impressive in all of North Africa. Narrow cobbled streets play host to hundreds of traders selling everything from silverware to slippers to spices to lanterns to carpets – it really is an incredible place to wander around and take in the hustle and bustle of a modern day market thriving in an ancient setting. There are old palaces, mosques, madrasas, riyadhs, art galleries, and museums to look around in the city, as well as plenty of great restaurants and coffee shops. You could also visit the tanneries, where raw leather is washed and soaked in a myriad of colours before being left out to dry in the sun before going off to market. The tanneries are a short drive from the centre of the old town, but definitely worth visiting to witness dozens of men walking around the ancient clay pits full of colourful dye! If the hustle and bustle gets too much you could always visit a local hammam to wash away the day. It’s one hell of an experience as you lay on heated marble flooring and people scrub and massage and stretch you whilst throwing hot water all over you. Rest assured the last of the Saharan dust will disappear after 30 minutes in the hammam! 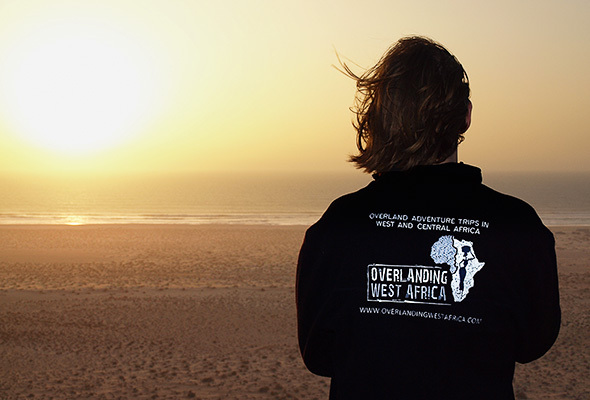 Please Note: This trip can be combined with our Freetown to Dakar to make the ultimate West Africa Overland adventure!